The National Credit Union Administration (NCUA) released mostly positive year-end 2018 financial data on Wednesday (March 6th). The aggregate capital ratio for all federally-insured credit unions increased to 11.30% – up from 10.95% a year earlier. Over 98% reported a capital ratio (CR) of 7% or greater; over 83% reported CRs greater than or equal to 9% and 71% have 10% or above. The net interest margin (as a percent of average assets) increased from 2.99% at year-end 2017 to 3.13% at 12/31/2018. Likewise, the industry return on average was up 14 basis points over the year—from 0.78% to 0.92%. Total loans increased 9% ($86 billion) during calendar 2018 and loan quality improved. The delinquency rate of 71 basis points (bps) in the fourth quarter of 2018 was down from 81 bps a year earlier. The net charge-off rate was also down slightly (from 60 bps to 58). Membership at federally-insured CUs increased by 4.9 million during 2018 reaching 116.2 million at year-end. But here’s the rub. The biggest are getting bigger and the smallest are struggling. (See chart on page 2.) There are currently 308 topping $1 billion in assets. They account for two-thirds of the system’s assets. These CUs reported loan growth and net worth growth of 12.9% and a 9.85% increase in membership. At the other end of the spectrum, after losing 112 during 2018, there are now 1,421 federally-insured CUs with assets less than $10 million. This group holds less than half of a percent of the industry assets. As a group, these CUs reported a 2.2% decline in loans; an 8% drop in membership and a 2.9% decrease in net worth. At 16.02%, however, they also reported the best capital ratio. 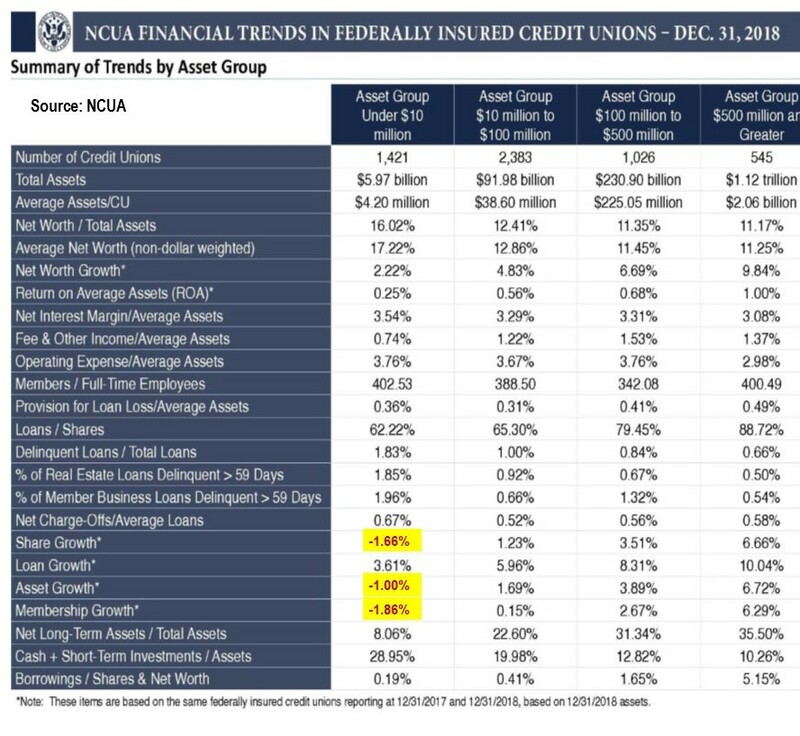 Please note: The chart below is from the NCUA but the highlighting was Bauer’s emphasis. The numbers may not agree with above due to the way NCUA calculated the growth (see the note under the chart). It does paint a vivid picture of the industry though. 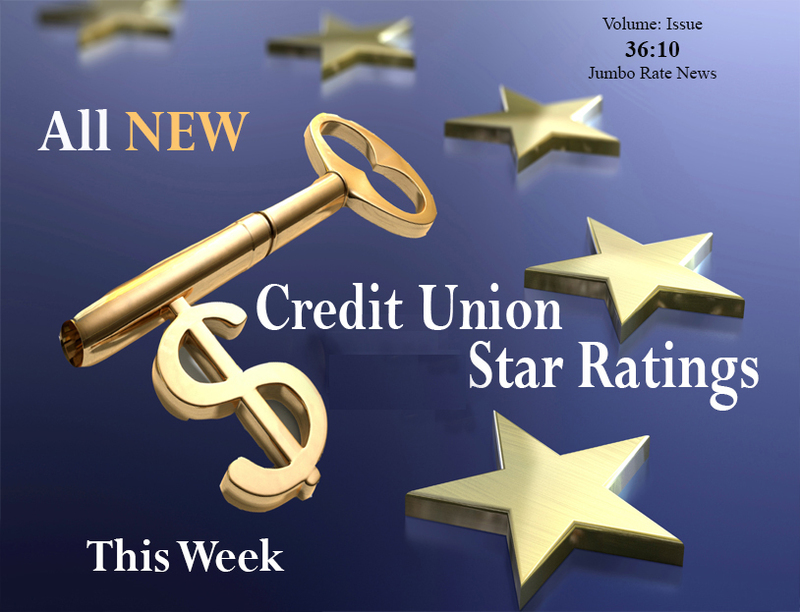 All Credit Union star-ratings are now updated on bauerfinancial.com and year-end reports are on their way.